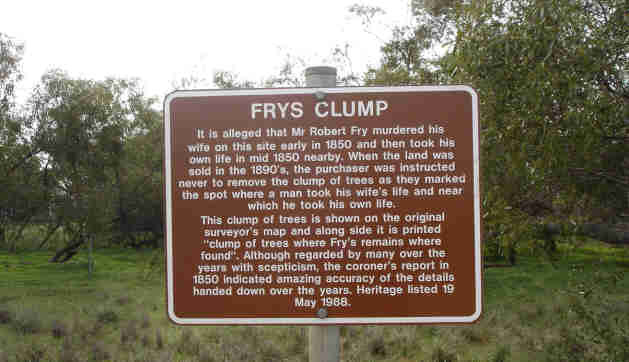 Fry's Clump, at Fry Flat near Balaklava, is situated on section 151, Hundred of Dalkey. Robert Fry took up an occupation licence in this area on 26 September 1844. On 11 January 1850 the local JP reported the murder of his wife and told the Colonial Secretary that he had buried the remains of the unfortunate woman on the spot, as I found the corps in such a dreadfully decomposed state. I have directed one of the police to watch if he (Robert Fry) should return to his home, as it is supposed he is stil lurking in the scrubs in the vicinity of the station. I regret to say there are three unfortunate children, the youngest is in a weak and sickly state of health. ROBERT FRY, THE MANIAC MURDERER. Sir, Having understood that several reports have been circulated about the case of Robert Fry, who some weeks ago murdered his wife in a fit of madness, which are utterly at variance with the actual facts of the case, I beg to hand you a real and true statement of the affair. I left here with Fry's late stockkeeper, in the employment of the only relative Fry has here, to take charge of the station and to superintend everything there. The first night we slept in the hut Fry was on the top of it, and set his dogs on to worry all the sheep we had on the station. The next night we camped on the side of the range and watched him down to the creek, where he took away one remaining sheep from her lamb. We have not only seen Fry, but he told one of the blacks called King Williamy, after rubbing the rifle over his shoulder, that he only wanted to shoot one more white man, and that if he told it to any white fellow he would shoot him (meaning King Williamy) next time he saw him. He was also seen hunting the bush by 2 blacks, named Bobby Robinson and Jeremiah; and I went with one of Mr Anstey’s shepherds 16 miles after 10 o'clock, to Robinson’s Point, to ascertain the particulars. I afterwards went, with three of Mr Anstey's shepherds, down to the blacks, and they stated they had seen him with his trousers torn up to his knees, no hat and carrying a gun over his left arm, and making all kinds of wild motions. On Tuesday afternoon the writer of the above letter, who has given us his name, called at our office and, in addition to the information it contains, mentioned that the fear of Fry is so great in the neighbourhood of his station, that it is utterly deserted, no one daring to go near the place. The property is at the mercy of himself, the natives, or any chance marauders. Fry has always been, as our informant expressed it, much more like a native than a white man, and could subsist for any length of time in the bush without difficulty. There can be little doubt therefore that armed and resolute as he is, his capture will cost a desperate struggle. The police were still after him, seeking the blacks who are supposed to know his haunts. The reason of our informant leaving the station was, that Mr Allom, Fry's late overseer, accidently shot himself in the head, and it was found necessary to bring him into town. The writer was anxious it should be known how this unfortunate circumstance occurred, as he had heard it falsely reported that Mr Allom had been shot by Fry. The wound, at the time he called, had been examined by Dr Davies, who had hopes that it was not dangerous. Ed. S.A.
On 12 March, the South Australian reported that Captain Berkeley, Inspector of Police, who has just returned from the north, informs us that he has been unable to trace any of the reports concerning Fry, the unhappy maniac, to an authentic source. He is impressed with the idea that they are wholly unfounded and that the poor creature has long since died in the bush. This could have been the case as the South Australian of 31 March 1850 listed Enoch and Robert Fry in the Unclaimed Letters columns. The Register of 17 May 1850 carried the following ad. Dairy Cows and Run. E. N. Emmett & Co. have received instructions to sell, from Mr Edmund Bird next of kin to Mr Robert Fry (supposed to be dead), 60 head of dairy cattle and run; the cattle to be at the risk of the purchaser. The sale will take place at the Auction Mart of the Auctioneers, Rundle St on Monday, 20th May, at twelve o'clock precisely. The next day the Register of Saturday 18 May 1850 carried an additional ad which stated SALES BY AUCTION THIS DAY: By E. N. Emmett & Co. At the Government Market yards, at 12 o'clock, Horses, mares, and foals, the property of Robert Fry, supposed to be dead. On 2 July 1850 the South Australian reported that; The remains of the maniac Fry, were discovered a few days ago (28 June) by Mr Alexander McCulloch, within half a mile of the spot where the unfortunate man killed his wife, and between four and five miles from his late residence. Mr McCulloch came upon the bones accidentally in the scrub; they had been scattered, and the clothes much torn by the wild dogs, but there is no doubt of their identity, the rifle, pistol, pocket-book, and cutting knife which Fry was known to have had with him and also the bonnet of his late wife, were lying near them. Information reached Corporal Dungey, at Gawler Town, on Saturday, who brought the news into town, and on Sunday night a Constable was despatched to the spot to take charge of the remains, on which it is expected that William Slater, Esq., J.P., will hold an inquest on Thursday. (After the inquest Robert Fry was buried at Penwortham). The discovery will be advantageous to the children of Fry as the letters of administration can now be issued, and the property of the deceased preserved for their use. A month later the Register of 6 August 1850 while reporting court cases stated; Robert Fry, deceased. Mr Hanson moved for a citation directed to Edwin Bird to produce the will of Robert Fry, deceased. The learned gentleman read, in support of his motion an affidavit by Alfred Andrew Fuller Allum, and George Walpole Leake wherein the first named deponent stated that he handed over to Edwin Bird a document in the handwriting of the late Robert Fry purporting to be his last will and testament, and other documents relating to the property and effects of the said Robert Fry; the defendant (Bird)) stating that, with the exception of the infant children, he was the next of kin to the deceased. The deponent went on to state that he was acquainted with the content of the will, that it bequeathed all the property of the deceased to his wife, and devised that at her death it should be equally distributed among his children, and appointed Enoch Fry and George Comley executors. The second deponent stated that he had formally demanded the before mentioned will of the defendant, who admitted it was in his possession, but refused to deliver it and or produce it. His Honor granted the citation. Mr Hanson applied, on affidavit, for a citation calling on Mr E. Bird to produce the will of the deceased, which it is alleged he has in his possession. Solicitors to the estate of the late Robert Fry, deceased. New Exchange Chambers, October 8th, 1850. ALL PERSONS indebted to the estate of Robert Fry, late of the Wakefield, stockholder, deceased, are requested to pay the amount of their debts forthwith to Messrs Hanson & Hicks, at their offices, and all persons having claims upon such estate are requested to send in the particulars of such claims without delay to HANSON & KICKS, Solicitors to the estate of the late Robert Fry, deceased. New Exchange Chambers, October 8th, 1850.